CONTRACTOR: System Development Services Inc. The 5,000 S.F. Concrete access deck to Trigen Energy, a main supplier of steam heat to downtown Kansas City, Missouri, was a continuous maintenance problem. The deck itself, adjacent to a 100 year old structure, had numerous large random cracks, steel inset deck plates and various contraction joints, all of which were a main source of moisture migration. This moisture penetrated directly through the deck, into locker rooms, shower rooms and a machine shop area. Because of a limited shutdown time frame, and restricted ingress/egress, the owner required a rapid curing, extremely durable, waterproofing membrane. 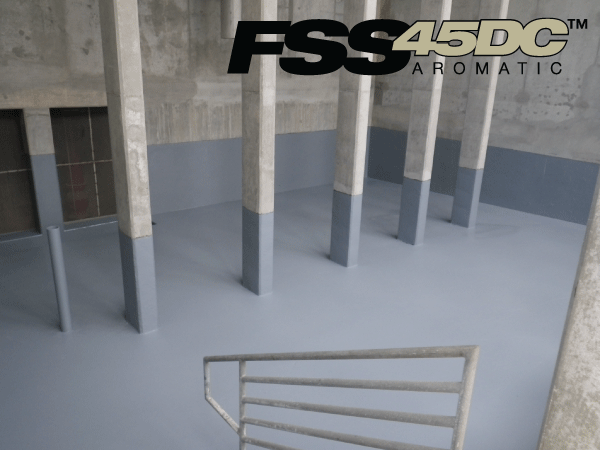 Several products were considered, however because of the rapid cure times and durability of the polyurea elastomer coating, VersaFlex FSS 45DC was chosen. The deck preparation consisted of sand blasting, crack grinding and filling the cracks with VersaFlex SL/45 polyurea sealant. Then the surface was primed with VersaSeal, and a 65 mil top coat of FSS-45DC was applied. The priming and coating were completed in approximately 7 hours, at which time the deck was reopened to traffic.